Raymond, Alberta, is located in the far south part of the Province of Alberta, Canada, approximately twenty (20) miles south of the City of Lethbridge, the regional center of the area. The Town of Raymond was founded by Jesse Knight, a Utah industrialist and member of The Church of Jesus Christ of Latter-day Saints (L.D.S. or "the Mormons"). He saw the area where the Town was established as part of a vast open prairie plain with rich soil but very sparse rainfall. Because of the experiences of the Mormons in settling Utah and the widespread use of irrigation, Mr. Knight saw the potential of the land with water provided by irrigation systems. After sending his sons to investigate, he purchased a block of 30,000 acres of prairie and the first settlers arrived in Raymond in 1899. On July 10, 1901, Mr. Knight contracted with the Canadian Northwest Irrigation Company and the Alberta Railway and Irrigation Company to purchase an additional 226,000 acres provided he construct and operate a sugar refinery ready to handle a sugar beet harvest in 1903 and to keep it in operation for at least twelve years. Mormon families from the area of Utah south of Lake Utah (Spanish Fork, UT, area) were recruited to settle the land, establish a system of irrigation, and grow sugar beets for the promised factory. Following the signing of the contract, the Town area was named "Raymond" for Mr. Knight's oldest son, Raymond. The Town charter contained a forfeiture clause to the effect that if liquor, gambling or houses of ill-repute were established, their property owners would forfeit title to their individual lands. In keeping with the close ties of the Mormon Church to the settlement of Raymond and surrounding areas, the Raymond Townsite was dedicated by L.D.S. Apostle John W. Taylor together with about 150 others on Sunday, August 11, 1901, and the town site itself located. The first families began to arrive and settle that same year. Although the sugar factory closed some years ago, sugar beet farming continues today in the area, with the sugar beets processed at a factory in nearby Taber, Alberta. Jesse Knight's vision of the area as extremely agriculturally productive has been realized and a wide variety of field crops are also grown in the area. An Internment Camp for Japanese residents of Canada was established at the start of World War II. Some of these people were residents of the area and many others brought there by Canadian authorities from the British Columbia coast. Many remained in the area following the end of the War and their release, and there is a substantial population of Canadians living in Raymond and area who are of Japanese ancestry. Present-day Raymond, is a town of some 4,000 people, and is still heavily L.D.S. The Town of Raymond has in many ways become a "bedroom community" for the City of Lethbridge to its north, close enough to Lethbridge to enjoy the urban comforts but retaining a rural atmosphere. The flag of the Town of Raymond is the same dimensions as the flag of Canada, with a 1:2 width to length and the same crimson bars at each end of the flag. Each bar is 1/4 the length of the flag. The center 1/2 of the flag is white with a crest imposed. 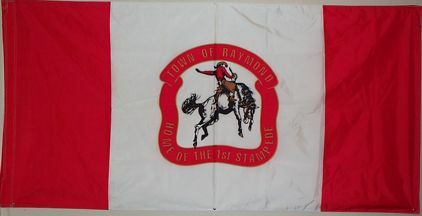 The crest includes a symbolic cowboy on a bucking horse, in colors black and brown, with the words "Town of Raymond" and "Home of the 1st Stampede" in gold letters in a crimson outline around the symbol. The Raymond Stampede was named by Ray Knight, one of the founder's sons, in 1902. He is quoted as saying "If these wild horses should get frightened and stampede . . . "Stampede". That is what we will call our celebration." The Raymond Stampede is a rodeo which has been held in the Town on July 1st, starting in 1902, until today. It was initially a way for the ranches in the area to settle the argument of which ranch had the best riders, with contestants participating in the rodeo for the fun and glory. Overshadowed now by its bigger cousin in Calgary, the Raymond Stampede remains a classic western small-town celebration. The date on which the flag of the Town of Raymond was officially adopted by the Town Council as the official flag of the town is not clear. It appears that the flag was first used unofficially, but adopted in the 1980s.